4 3/4 x 8 inches. 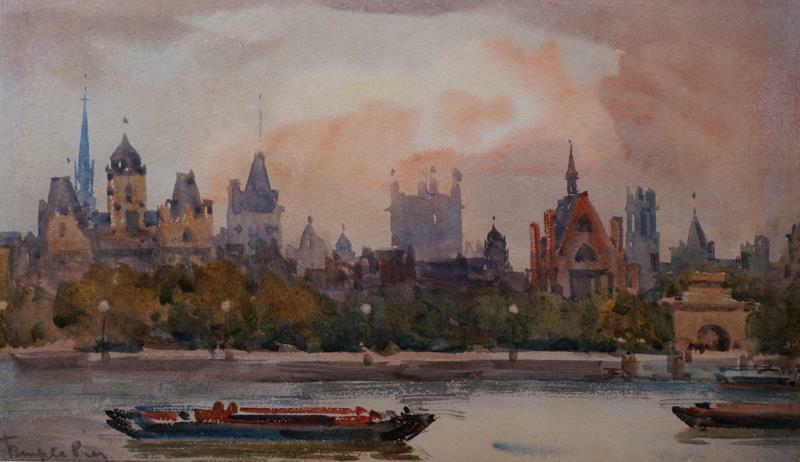 Painter in oils and watercolour of views of London and the Thames and also West Highland scenes. William Alister Macdonald was the son of a Scottish Free Church Minister from Clyne, Sutherland. He exhibited in London between 1892-1936 at the Society of British Artists, the Royal Academy and elsewhere. He had two exhibitions at the Arlington Galleries in London in 1935 and 1936 and the Guildhall Art Gallery have a collection of London views that were purchased at the second exhibition. It is his London views that are most collected. He travelled widely, particularly in the South Pacific, and lived at one time in Gauguin's house in Tahiti. He died at the age of 96 at Pao Pao, Ile de Moorea, French Oceana in 1956.